● Ottawa traffic devices lure cyclists into death traps. Here’s an interesting ‘thought experiment’. Try thinking of a way to lure cyclists into a dangerous and potentially deadly situation, and keep it all legal. How about a traffic light system that appears to accommodate cyclists, but often entices them into a precarious situation. The system’s sensors are specifically calibrated to respond to the presence of bicycles. 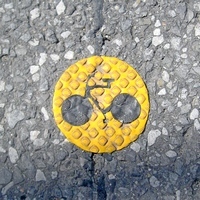 In some cases, the little yellow dots that mark the location of the sensors buried in the pavement even have a bicycle symbol on them. The system promptly responds to cyclists when they stop at a red light and place one of their wheels over a sensor. At this point, cyclists do what million of pedestrians and motorists do everyday. Rather that stare blankly at the traffic light directly in front of them, they try to figure out when they will get a green lighy by looking to the side, at the traffic lights for the street they want to cross. When looking at the lights for traffic passing in front of them, they see the pedestrian signal begin to flash a red hand, and soon after, the main traffic light changes from green to yellow, and eventually to a solid red. At this point, thinking there own traffic light is about turn green, the cyclists rides into the intersection, and quite possibly, a death trap. The problem is that in some cases, the cyclists never get a green light. Instead, the red light for the street they are about to cross instantly reverts to green. This is what happens if cyclists moves their wheel a few inches off the sensor before their own light turns a green. Needless to say, this small movement is easy to do when putting your foot on a pedal and getting ready to push off. Of course, all this is legal. Cyclists who get lured into an intersection under such conditions are technically running a red light. Unfortunately, the outcome of this ‘thought experiment’ is very much a reality in Ottawa. Off hand, I can think of at least three intersections that are equipped with such traffic lights, and there are probably many more. They may not always be evident because the dangerous light changing sequence will not occur if there is also a car stopped (in either direction) at the same red light as the cyclists. I first started noticing these types of traffic lights a few years ago. My wife and I were stopped at a red light on our bicycles at an intersection in a quiet area of Kanata with a 50 km/h speed zone. Thinking she was about to get a green light, my wife proceeded through the intersection. There was a car travelling on the street she was crossing which was coming to a full stop because its light had changed from green to yellow to red. However, when his light suddenly reverted to green, the driver hit the gas and leaned on his horn. My wife made it across the road safely but was sure the driver had run his red light. I stayed back and could see what happened. When I told her about it, she was dumbfounded. Sometime later, I was stopped at a red light in the area behind Mountain Equipment Coop (Roosevelt & Byron). By then I knew about the need to keep my wheel right over the sensor, but I guess I got careless and I didn’t get my green light. In the meantime, a car travelling on the street I was waiting to cross came to a full stop at the red light. But the driver was surprised to see her light suddenly revert to green. Thinking something was wrong, she waved me across the street in front her car (there was no other traffic at the intersection at the time). I’m sure there are spin doctors out there who will defend these traffic lights with talking points about the need to maintain traffic efficiency, safety being a number one priority, and the benefits of sensors that respond to the presence of cyclists, and so on. But none of this changes the fact that these types of traffic lights produce situations that are dangerous, and even deadly for cyclists. 1 Comment on ● Ottawa traffic devices lure cyclists into death traps. such as:http://www.flir.com/traffic/content/?id=66601 uses video analytics etc… the way we should be going as video analytics can progressively learn and adapt along with perform stats on traffic while monitoring. Well worth the investment… towards smart cities. She said an advance green is coming for pedestrain/cyclists as well, cyclists will be given the option to use the sidewalk. Why didn’t they just design the bridge suitably in the first place??? the key – focus groups – using pedestrians and cyclist first! Instead, they’ll spend millions fixing this problem or worse, wait until someone gets hit.